Thank you so much for visiting our shop! 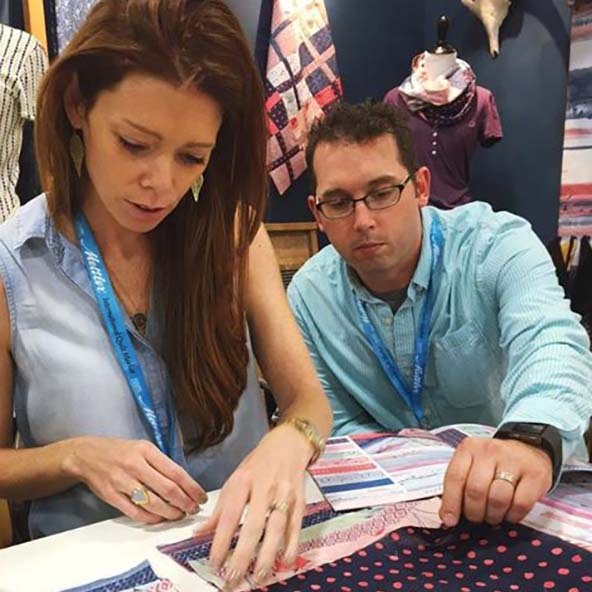 We are Charlie and Lindsay, a husband and wife team working together along with an amazing staff to grow our fabric shop in Upstate New York. We are actually elementary school sweethearts and began “dating” two decades ago. We're now happily married with two children and wall to wall fabric in a renovated 19th-century chocolate factory in Red Hook New York; life couldn't be sweeter. Charlie and I have been retailing collections from other manufacturers since we began our shop back in 2008 (out of our home on Hawthorne Ave, hence the name). Hawthorne Threads was actually born from my Etsy handmade shop. Having studied Geology in college, I've gone from plate tectonics to textiles—from rocks to frocks, if you will. No one is more surprised by the shop's existence and subsequent growth more than I. We often marvel at the very different path we find ourselves on, and how much our lives have changed since we began selling fabric just a few years ago. After struggling to find a one-stop shop for the contemporary fabrics I used in my home decor pieces, I decided to take the plunge and order fabrics by the bolt. I enjoyed moderate success on Etsy, but not quite enough to warrant the use of full bolts; so I began selling the rest of the yardage in a separate fabric supply shop on Etsy. With the next generation of sewers, makers, and bloggers out there, we quickly realized how many people shared my passion for boldly vibrant designs and our selection quickly grew to the point where we needed a stand alone site. Rather fortuitously, Charlie is a software developer and in July of 2009, he left his day job to join me full time to focus exclusively on Hawthorne Threads. 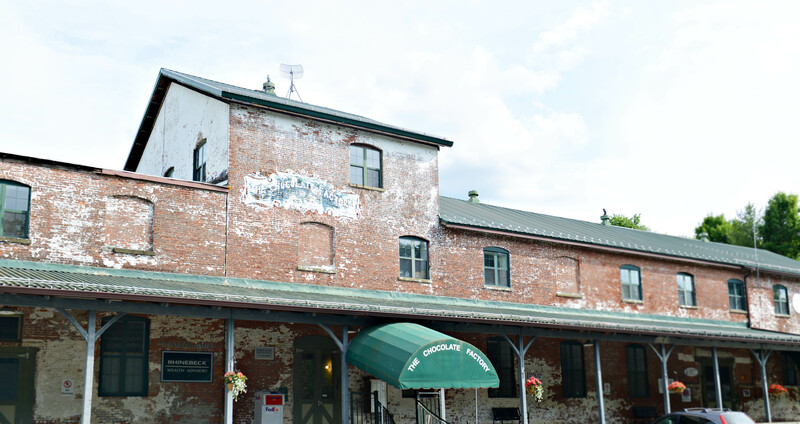 In 2011 we moved the business out of our basement and into our current warehouse space in the Hudson Valley. Charlie and I run the business as a team, along with a truly wonderful staff. Having known one another almost our entire lives, Charlie and I are not often met with challenges we can't tackle together in a positive and constructive way. It also helps that we have very different strengths that bring unique insight to the business. I won't tell him how to program and he won't tell me which fabric to buy. We didn't set out to be business owners, and neither of us would be in this position without the other. I think remaining conscious of that division actually helps us to work together in a very yin and yang sort of way. 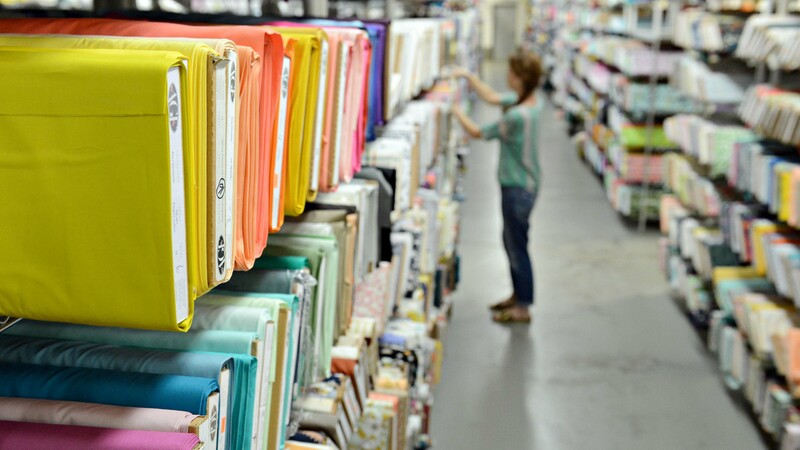 Three years ago this fall we began designing and digitally printing our own collections, now offering over 8,000 In House designs, a growing percentage of our inventory that totals a little over 14,000 available SKUs. 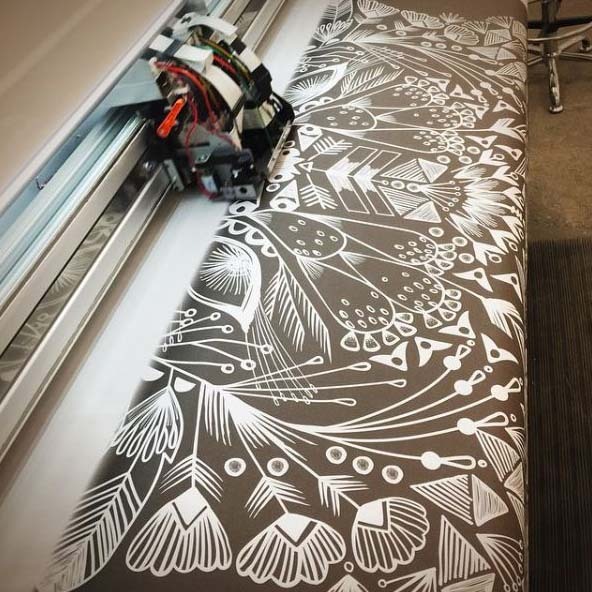 Recently, we have welcomed some very talented outside designers to our digitally printed fabric offerings. 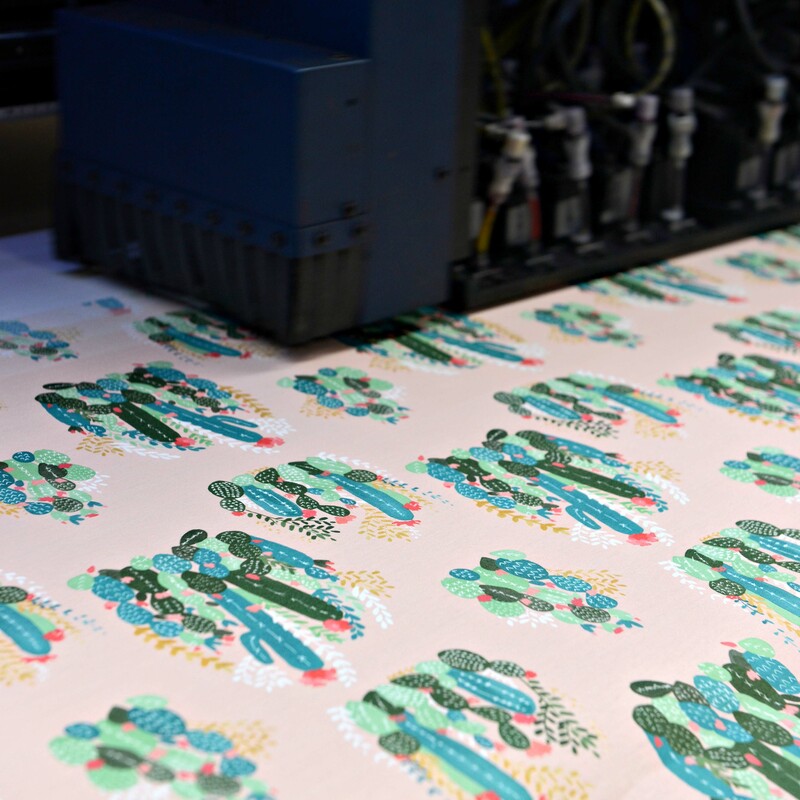 All house fabrics are printed on digital roll to roll printers using water based pigment inks, a process with enormous environmental advantages that we hope you'll read about in our FAQ's section. Available fabric choices include Poplin, Quilting Cotton, Linen Cotton Canvas and Rayon, and Jersey Knits - organic options too! Part of the "why did we decide to go digital" is because we've realized that, for better or for worse, We seem to thrive on challenges that we can tackle together. I think the business started to feel a little too comfortable and we both felt ready to push ourselves creatively. Charlie and I decided we needed to be the architects of our own destiny, both for our own livelihood and for that of our staff. I've always loved pattern and design and while the idea of creating our own ranges was mine, the credit goes to Charlie for actually setting it into motion (translation: he had the guts to purchase our first printer that cost more than a car!). That pretty much sums up each incarnation of our business, in fact. Once a plan is set in motion, we strive to do the best we can both for ourselves and each other, but also for the craft and our contribution to this next generation of makers. Since the beginning, our mindset remains as Yoda would say, "do or do not, there is no try." We are grateful that our customers have supported us throughout our first 10 years in business, welcoming the change and innovation that goes along with digital fabric printing. That change includes our updated company name to Hawthorne Supply Co; with the impending release of digitally printed wallpaper and gift wrap, we are excited to supply you with the tools for a creative life. I'm reminded of a quote I read while studying geology in college - Faith Baldwin writes that "time is a dressmaker specializing in alterations." I love that it marries two very different life paths for me, and at the same time, embodies the very idea of change over time. We are always open to change and are excited to see where the business takes us in the next ten years.